Back nearly 10 years ago when the raceway was getting set to open there must have been a sale on green bed sheets. Someone took advantage of this and these were used along the base of the drag strip which is over 70′ long to cover up the wiring and steel frame, you know to give it a finished look. A couple years ago when we had won our second bid to host the national championships it was decided that those sheets after years of abuse needed an upgrade. Pam Klinger to the rescue! Pam is the wife of local racer Fred Klinger who are the grandparents of our very own Piper Clark. Pam made some nice black fabric covers with a checkerboard border across the top to replace the green sheets that had done their duty for so many years. These came out great and really transformed the way that side of the shop looked. A few weeks ago Pam might have mentioned by accident she did not have enough going on so I thought to myself we cannot have that! 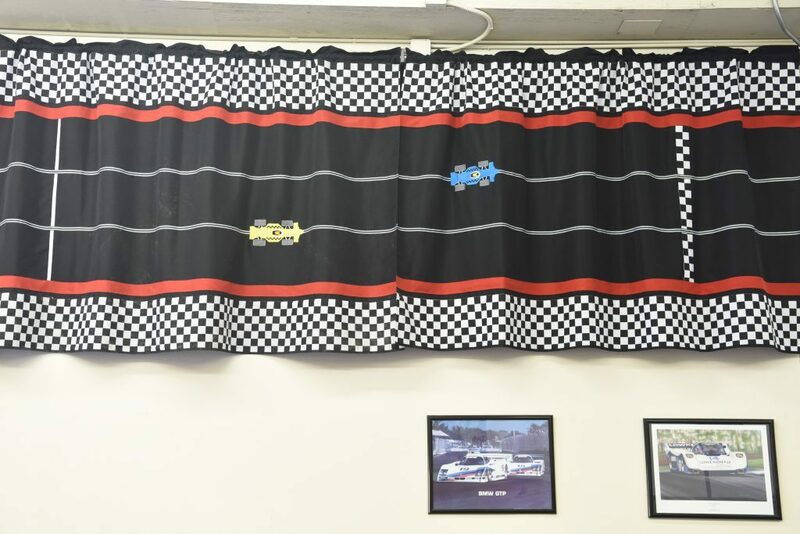 So Pam was tasked with another upgrade project: To replace the black sheets that hung above the wall near the rental track that covered our storage cave. While no racers were able to fling solder on these, they had faded over time and were in need of an upgrade. I really want to thank Pam, Fred and everyone both past and present who have helped with small to large projects at the shop to make it a better more inviting place to spend time — Diane and I really do appreciate the amazing support from our customers and friends.